If you're going to choose your car wrap company mostly by the lowest price than you are better off wrapping the car yourself. It will most likely look the same but save you a lot of money. We have been in this business a long time and have seen many companies come and go. The major factor why the long term companies are around is because they do not sacrifice quality for price. This usually results in fewer failures to fix later and most importantly, happy and repeated customers. We're not saying that things never fail or go wrong. After all, we are all only human. Its all about doing things properly to minimize failures and taking care of them when they arise. IJ 180Cv3-10 with proper overlaminates 8518 Gloss, 8519 Luster, 8520 Matte - Designed for most commercial vehicle application. IJ 380Cv3-10 with 8580 overlaminate - Designed for vehicles with deep channel such as sprinter vans. IJ 1080 - Designed and used for full wraps and custom color changes. We have used and continually try other manufacturers products to better understand the products available to us. We take pride in our work and always want to use the best products available so that our customers can be confident in our work. Things we have seen: Companies telling customers they are using 3M products only use and install other low quality vinyl products which are far inferior to the major manufacturers. Each manufacturer has a different pattern in the vinyls adhesive which is their patented design making it possible to identify the type of vinyl used. This is the most important on a vehicle wrap. While some people may disagree, the background is what will turn people's heads and get them to look at the advertisement. It must be done so that it is creative and attention grabbing but not so far as to take the attention away from the Foreground layer explained below. The background's sole purpose is to make the graphics interesting enough to look at and easy enough to remember. The background should tie into what is being advertised. It can incorporate graphics related to the business, it's products and services or take advantage of corporate identity branding such as colors and patterns. Utilizing one of these two points will help in getting attention and increasing retention and brand awareness. The foreground is for the most important information such as company name, tag line, phone number and website. This layer should stand out the most on the vehicle. It should be front and center and easily legible. By looking at this information, a person should be able to understand what the advertisement is about. 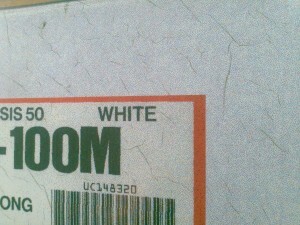 If there is too much information, no one will remember anything and the advertisement is a waste of space. This section is usually optional and does not always have to be on a vehicle wrap.It should be more subdued compared to the foreground information and it would usually consist of 3-4 bullet points about the company, its products, or services. Adding too much information will make the wrap too cluttered and defeat it's purpose. Without getting technical, vehicle graphics should always be printed on high resolution settings and the printer should be calibrated properly. With the technology available today, printed graphics should be pixel free, vibrant, and crisp. If you would like to learn more about the various printing techniques we use, please come back in a few weeks for another updated blog entry. Poor resolution will result in a pixelated or blurry image with dull colors. Poor calibration will result in poor print quality, significant banding due to misalignment of the print head, and poor color output. Graphics setup for print is important as it can help or hinder an installer ability to install the wrap properly. In essence the less overlapping seams on a wrap the less likely it is to fail in the future for any number of reasons. We setup our files in a way which produces more waist but leaves as little or no seams on the vehicle. The illustration to the right shows a diagram of a 2 file layout possibilities. Things we have seen: A customer asked us to match their current fleet colors. This was difficult because the graphics were pretty pixelated. When we asked why their colors are like that they replied with: "We were told this was the only way they could match our colors". Vehicle must be cleaned properly - if a vehicle is not cleaned properly, the vinyl wrap will most certainly lift and fail. An adhesive primer should be used sparingly on or around high stress points on a vehicle - Areas such as deep channels, door handles and wheel wells are more likely to fail than other parts of the vehicle. An adhesive primer is applied to these areas to increase the strength of the adhesive so that the graphics last much longer. Seamless installation - It is possible on most vehicle to install the graphics without any visible seams. This is accomplished by first setting up the print files correctly followed by proper installation. However, some vehicle are too large and there is no way of getting around having overlapping seams. Direction of overlapping seams - At times when there is no other way for the seams but to be visible, the seam must always overlap from the front to the back of the vehicle. This prevents the vinyl lifting from the friction of the wind as the vehicle drives. Taping perforated window film. Taping the edges of perforated window film on vehicle is important to increase the life expectancy of the graphics. If the edges are not taped with optically clear tape, it will fray as the wind passes along it resulting in severe lifting. Siliconing Edges - This is mainly done on Food Trucks and sometimes trailers. Food Trucks especially have many channels and obstacles and the application of silicone helps the graphics last a very long time. Things we have seen:One of our customers came in after having his hood wrapped 2 times by another company. It kept ripping along 2 sections of the hood. That customer was told that they were driving too fast for the vinyl. If experience has taught us anything, it's that doing it right the first time saves time and money for both parties. A properly designed, wrapped and installed car wrap can have a positive effect on a brand or product as well as give it credibility. A poorly designed and installed wrap can damage a brand or product through people's first impression or not have any effect at all because no one knows what is being advertised. 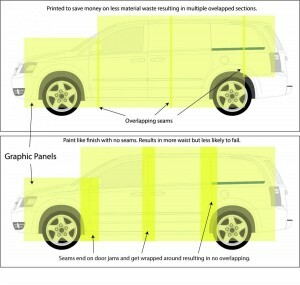 The purpose of this blog post is to educate people on what to look for in vehicle wraps and the companies who do them. This industry is still fairly young in Canada and many people have never gone through the process of wrapping a vehicle. Take your time and research various sign companies and vehicle graphics shops and choose the one that you feel most comfortable with. We are not the only great wrap company out there. There are others but they are not always easy to find. All of the factors above increase material usage, ink consumption, production and installation time. However, the result is a vehicle wrap which can easily last 5+ years rather than a few months. If you have any questions about the vehicle wrap process, please give our office a call and one of our staff will be more than happy to answer all of your questions.